My name is Roger Flansberry from Gatineau, originally from Maniwaki. genealogical lineages and also helping others to build up family trees. which I consider a "must genealogical site" for all researchers of this area. It is the couple Alexis Morin - Mary Ann Metorvist Natawissi (Mary-Ann also carried surnames such as Natopesi). (Antoine and Catinin Jibatikokwe in Maniwaki, 27/7/1886). Simon Pinesi Chawenasiketch and Marie Angelique Ozabikwe (married August 31 1818). All we have on this couple is that they had seven known children born between 1840-1855 in the Maniwaki area. I have complete ascendance of Alexis Morin. He was also remarried to Henriette Menard September 10 1857 in Maniwaki. No date or information on Mary Ann death, burial...and parents. wondering if you would have any material on that couple elsewhere or any orientation for me to take. Maybe this inquiry could (should) be posted on your site...? Here is a baptism, recorded at Notre Dame in downtown Ottawa. Surnames of The Algonquin people, transcription of names, etc. because they are known to have spent summers in Oka / Kanesatake. Phil Jenkins' book An Acre of Time has much information on Pierre Louis Constant Penency. who settled with his sons and brothers in Curran, Ontario, in the mid-1800's. There may be a relationship. according to their customs, not white man's customs. However, that was years ago and I became less interested and kind of dropped the thread in that area of genealogical research. signature at the bottom of a letter was that of a little bird. (see symbol signature on the Drouin record, below). of an oral expression. That's my theory, I have no proof. in my filing cabinets but I haven't looked at these for years. Probably take a while to find them also. have been cousins many times removed. on the spur of the moment) who published much information based on these baptismal records. That's also available at the LAC. 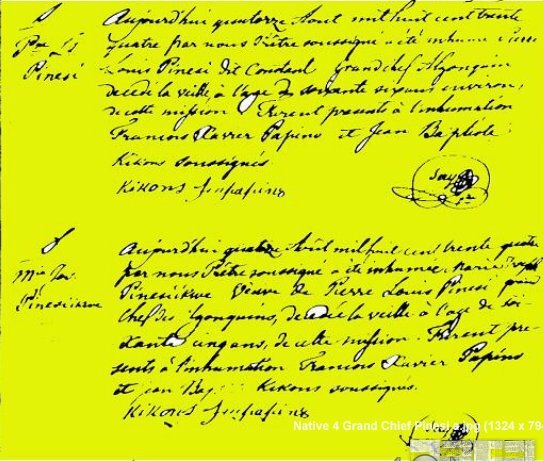 You know I like to help out but finding Natives names spelled in unreadable French language, barely legible is a challenge. times but I did find some. 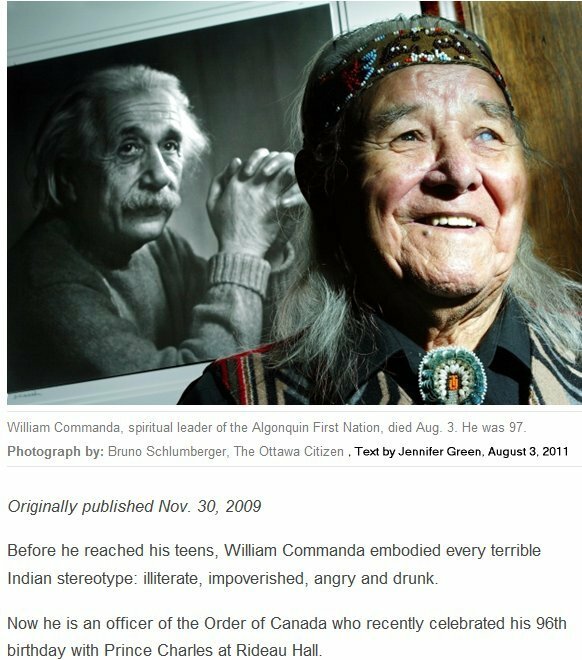 One interesting one is Louis Pinesi dit Comandant / Commanda, Algonquin Grand Chief (COMMANDA ?) and his wife died in 1834. This is very interesting and may open a still largely unknown history of the presence of Algonquins in the Ottawa area. I do not know Chief William Commanda's genealogy and there may be a relationship. However, the text here is definitely "dit Constant"
fur trader named "Constant". Also, Constant Creek flows into Calabogie Lake on the Madawaska River system. very well be that our Ottawa Constant Penency may be the same person and that he passed away in Oka / Kanesatake on the 14th of August 1834.
to a social position (?) ). need to be explained by a more knowledgeable person. Ont area,  which ties in with Phil Jenkins' interpretation although he may have mistaken the son for the father (?). ran a lodge where Constant Creek flows into the Lake. Also, here is information about Alexis Morin and Mary Ann NATAWISSI (the origin of this web page). The different spelling of Mary Ann's surname is probably due to spelling / transcription.